It struck me recently that I often share what I am sewing or how to make something. But I haven’t shared a lot about me! So I thought it was high time I rectified it! 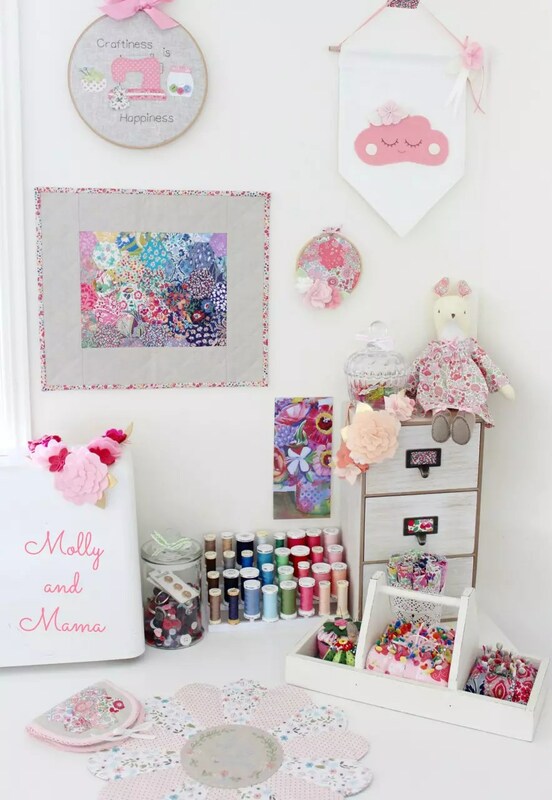 Here’s a little look behind the scenes at Molly and Mama land. One of my favourite magazines, ‘Tickle the Imagination‘, asked me to share a little about myself in a ‘Meet the Maker’ feature. Answering Tanya’s questions really got me thinking about what Molly and Mama means to me. So here’s a little look at some of my answers. Since I was a small child, I’ve been making and creating in one form or another. I was blessed to grow up in a family where we could craft and sew, draw and paint, and get creative! It’s been a way of life for me, and something I just never grew out of. So it made sense that I’d pursue a creative job. But that didn’t really happen until my children came along. I first started sewing for family and friends. One thing lead to another and Molly and Mama was born. My grandmother Molly, and my mother (whom my kids call Mama) inspired my love of all things creative, and encouraged me to follow my dreams. So I named my business after them. It just made sense to me. The business has certainly changed and developed over the last five years. I began by selling ready-made accessories, embellished t-shirts, simple clothing and pretty décor. But then I started to notice how much I enjoyed the creative process, and also enjoyed sharing it with others. I also noticed people around me often commenting that they wished they were creative, or could sew. And I’m still surprised to hear these comments, because in my mind, we can all design and make. I realised there were many people out there that wanted to try their hand at a traditional craft, but mistakenly believed it was difficult. So that inspired me to design simple-to-follow craft patterns, with lots of step-by-step instructions, clear photos, and with no sewing jargon. 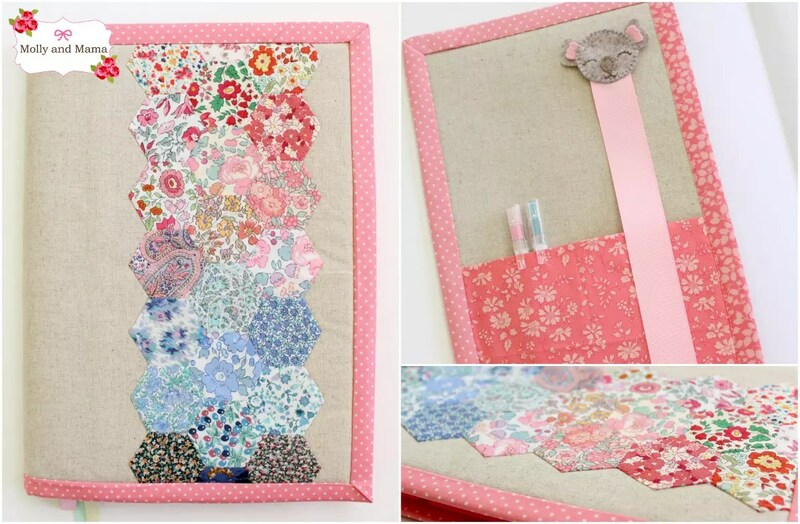 I wanted my patterns to inspire beginners to pick up a needle and thread and give a sewing project a go, just for the fun of being creative. I wanted others to feel that sense of satisfaction when their creative dreams became a reality. I hope my patterns encourage others, and share with them a love of traditional craft methods made modern. Inspiration can come from anywhere, and at any time. So I keep a note book handy at all times. Some of my sketched ideas can take hold in my mind, and then they just ask to be brought to life! So I grab some felt or fabric and get started. I think it’s really important to give your ideas the space to develop and grow though. I can spend weeks thinking about a design before I start sewing it. And not every project needs to be completed either. The sheer act of ‘making’ can often inspire another design or idea. Being creative encourages creativity. So I think if you always have something to work on, design, stitch or make, then you’ll be constantly keeping that creative process growing. And your creations will be new and fresh, original and distinctly yours. I love using instagram as a way to keep a record of what inspires me and what happens when inspiration strikes! Pop by my feed to get daily updates. I think when you’re a creative person, it isn’t something that can be compartmentalised to only one area of your life. I love drawing and doodling, and painting too. Cake decorating is always fun. Gardening is a huge passion of mine. Just check out my vegetable patch! I’ve always had a love of architecture and interior design too. And basically anything involving colour. I think your creativity is more about how you see the world, than what you do in it! I certainly used creativity in my job as a primary school teacher, but I’m using it so much more now! I find the best way to balance work and home life is to not aim for balance! It’s all a matter of priorities and scheduling. I’m a stay-at-home mum by choice. So that job comes first. But that just means that I make sure I plan for my business diligently, schedule in my deadlines and the steps I need to take to get there. But there are plenty of late, late nights and typing away on the computer, because it’s too late to start up the sewing machine! 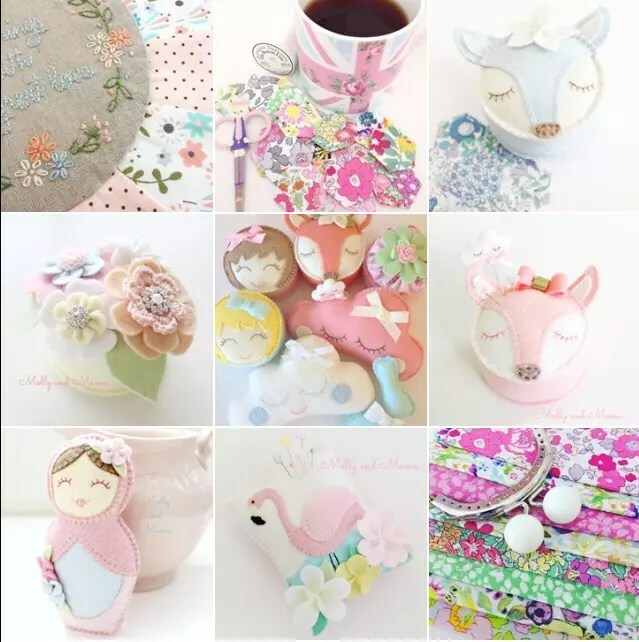 There are so many sewing, crafting, blogging, business and social media courses and tutorials available now. And I find that I’m discovering new things to learn everyday. So I just make sure that I pin all the links I don’t want to lose. 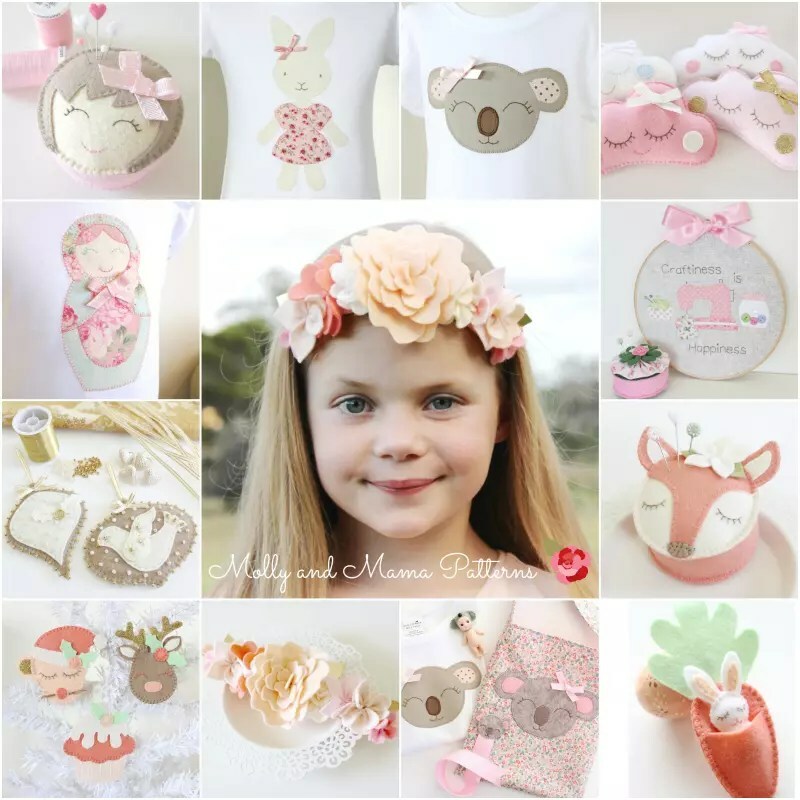 You can see more on the Molly and Mama Pinterest boards. I also find that networking is one of the most valuable tools available. I have met some fantastic ‘creatives’ online and would consider them friends, even though we’ve never met in person! Working from home can be a lonely occupation, so these relationships are vital! I also meet regularly with like-minded local business owners for a bit of Masterminding! We discuss our successes, offer help and advice, and act as accountability partners. So we check in on each other to make sure we’re meeting deadlines and fulfilling goals. I’ve found it to be so helpful for running an online business. Like everything in life, running a successful handmade business takes determination, hard work, and time. You need to be dedicated and willing to fail. Be open to trying new things, challenging yourself and thinking outside the box. But above all else, you need to be fuelled by a passion for what you do. When you love your business, all that hard work doesn’t feel overwhelming. It’s what drives you and motivates you to keep going! Surround yourself with likeminded people. If you’re a ‘one-woman show’, reach out to other creative business owners for support. Encourage each other, and share your successes and failures. Build each other up, and help each other to shine! It’s easy to stay on track when you plan, plan, plan. And when your planner is pretty! What’s next for Molly and Mama?